It is a strange moment when topics seem to converge, when an idea is spread amongst the "blogosphere" just enough to understand for certain that yes, a dialogue is taking place. Right now, permanence and meaning seems to be the subject on our collective mind. What started as a cross-blog discussion between game designers Clint Hocking and Manveer Heir evolved into an joint experiment of epic proportions. Ben Abraham of SLRC, shortly joined by Nels Anderson of Above49 and Michel McBride-Charpentier of Big Apple, 3AM, decided to play through Far Cry 2 with the threat of self-imposed permanent death. If their protagonist died, just once, it was lights out, game over. Clint addresses their undertaking here, which I encourage you to read. Meanwhile, I have been harvesting the benefits of being one member of a two member team. Scott, my blogger in arms, is a 'smart cookie' if I do say so myself. His recent series on game difficulty fueled my own thoughts on the value of difficulty as it relates to engagement. 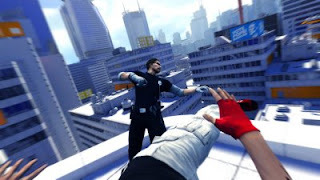 Thus, with trepidation, I decided to play through Mirror's Edge with permanent death to answer this question: Is permanent death still meaningful in world that is less forgiving than Far Cry 2. I entered the tutorial with strong intentions towards honing my skills, testing my memory on this simple course. Scott's tips for success became a mantra as I jumped, ducked, punched, and slide kicked around the map before properly embarking. Make no mistake, I knew exactly what I was getting into. My virtual parkour skills were nothing special during my first playthrough, but I was committed to putting in an honest effort. Skipping the cut scenes, I fell to my death in under twenty minutes. The goal of permanent death, as I see it, is to experiment with meaning. Is my experience more powerful if bound by mortality? Does this create a stronger evocation of emotion? There are a multitude of feelings and layered meanings to be derived from a given gaming experience. The sound of gunfire in Far Cry 2 may elicit fear in some or excitement in others. Although I was not saddened by Faith's early demise, the experience was more intense than I expected. My heart was racing as I approached the first large chasm, the red drainage pipe on the other side marked my single hope of survival. I remembered dying countless times on this very jump. I actually held my breath for the jump and let out a "yes!" when landed safely. My first encounter with gun-wielding police resulted in this same fear and elation. Fleeing helicopter fire in scene two, the thrilling pressure of pursuit was coming to an end as I spotted my escape route. At the apex of my leap towards an air vent ledge, I knew I had made a mistake. What should have been a wall run ended my game with that memorable woosh and thud. The meaning of difficulty is strikingly altered with the threat of permanence. On one side, temporary failures become important lessons. Forgetting to tumble after a long distant jump visibly hurts Faith and serves as a threat, as if from a strict master, to improve my skills lest I jump to my death. The deadly failure however is meaningless without the opportunity to correct my mistake. If I stop playing because I am dead, I cannot apply what I have learned. 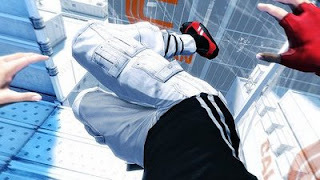 In the case of my Mirror's Edge play through, permanent death was meaningless by itself. It was the threat of death that enhanced my emotions, which itself is an external application. Permanent death didn't just change the story, it changed the game. The importance of my intent in creating the experience cannot be denied, nor can the intent of the Far Cry 2 'perma-deathers'. 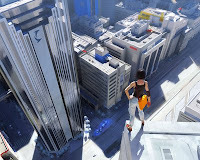 Permanent death in Mirror's Edge is less about Faith's story than it is my own story, my own commitment in the face of inevitable failure. Would Abraham's protagonist evoke the same emotions if his permanent death scenario were his first and only playthrough? Would Faith mean more to me as a failed runner than the triumphant sister she becomes at game's end? I don't think so. If anything, her death is meaningful because I know what she could have become and am left to imagine the consequences. I am playing an entirely different game because I have changed the rules. This is why the permanent death experience fascinates me. As I see it, the meaning of death and permanence is subservient to what games do best: the fostering of imagination. Gamers have long broken games, melding them to what they want them to be, regardless of linear design of authorial intent. Permanent death is another approach to imaginary rules. Meaning is the result of our own perceptions, embedded in and affecting external structures, interacting with a game world. In the case of permanent death, we are imagining a scenario that adds to our initial impressions. What are the narrative consequence of Faith's eternal death? Are their replacement runners? Does a civilian thirty stories below question their blind obedience when confronted with the corpse of a young tattooed girl? 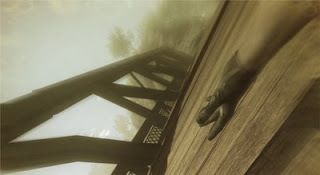 Similarly, my interest in the Far Cry 2 odyssey is in the imagined result of mortality on both player and protagonist. Does killing mean something different to Ben and his avatar? Are these suddenly mortal game characters afraid to die? Are we imagining a new set of motivations for our characters as we read long with Nels, Ben and Michel? Great idea! I wonder what other games could be enhanced by such artificial constrains. I recently thought how forgiving and unrealistic the radiation in Fallout3 is. How about a No-Radaway playtrough. The penalities associated with radiaton sickness would be permanent and possibly even lethal. One could also go even further and try a No-Stimpack playtrough, where crippled limbs couldn't be healed. Reading these recent Far Cry (and now Mirror's Edge via this very post) adventures has me pondering the future, more than anything. Heavy Rain I believe is a game trying something a little different in that, the narrative continues even if your character dies. How this actually plays out remains to be seen and it can work in some respects simply by the fact the the game is focused around more than one (playable) character, but even so it will be an interesting thing to observe. Perhaps, if successful, games as a whole will head into a direction where games as they're known now (with multiple deaths/retries) will happily coincide with games that go with the 'you die, that's it' route, in turn providing even more different experiences than we've already seen so far. If something like that does happen, then it will be intriguing to see how some of the more creative developers out there utilise that to (hopefully) improve the experiences they are trying to convey to the player. I like the Fallout 3 idea. The game seems to strive for realism in so many regards, I'm glad Nels mentioned in our recent podcast. The no-stimpack playthrough might be a bit too much for me. I agree with you completely on Heavy Rain, and will almost certainly be a PS3 seller for me. Quantic Dream's Indigo Prophecy had a nice permanence mechanic (in a way) that was a countdown timer until you had to make a decision. With so many decisions to be made in one sitting, and without the ability to know which decisions had which effects, the gravity of your actions was palpable. Yeah, Fahrenheit (as it was known here -- Indigo Prophecy for you) was one of the games that inspired my different way of thinking for games, approaching them with new perspectives and etc. It was great having to make all those decisions and then seeing the effects of them either through future events, or through the different perspective(s) of Carla and that other dude (Tyler?). If that was a hint at what is to come from Quantic Dream, then Heavy Rain can't come soon enough. Bring it on next year.